The homeowner here in NE Portland had some time off from work and came back for a couple of weeks, which meant road-trip time for Caretaking Couple. Our first stop was the SeaQuest Inn, right along the 101 and just south of Yachats, Oregon. We spent four glorious days and nights there. I have decided…nothing compares to hearing the waves crash right outside your open window on a foggy summer’s night. Looking Down at the Pacific from our Cape Perpetua hike. This coastline was another first for us. We took the 101 from San Francisco to Los Angeles back in 2006 and loved it; still people kept telling us how much more dramatic the Oregon Coast is in comparison to California’s. I had a hard time believing that anything could be more stunning than Big Sur, which is one of my favorite places in the world. 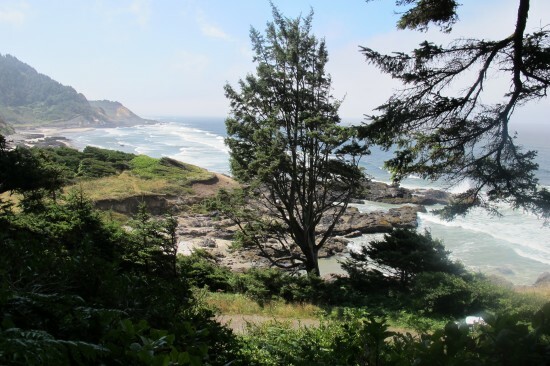 We spent the good part of our days on hiking the trails of Cape Perpetua and at several of the eighty-plus state parks along the Oregon Coast. Nerina set us up with a hearty, healthy and delicious breakfast each morning at the SeaQuest, and we hit The Drift Inn for dinner just about every night. We also brought wine, cheese and crackers back from The Wine Place to share in our room, or in the common room with new friends. This was the view from our deck at the SeaQuest. It was perfection. We actually saw a whale from this same angle during breakfast on our last morning there. I don’t have a picture because I could not look away from the whale and my camera would not have done the experience justice. I remember feeling the same way when Paul and I saw a mountain lion right outside our living room window in Evergreen…we were glued in place; mesmerized. Everything about these few days was spectacular, with special thanks to Mother Nature, along with Innkeeper Nerina and the rest of the SeaQuest staff. I sincerely hope we are fortunate enough to return for another stay.